"The Torah was given to make peace in the world" a famus quate from the Talmud. 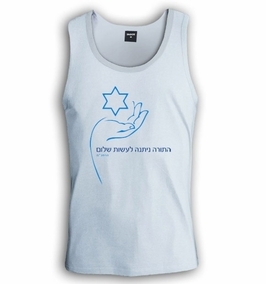 We gave it our visual interpetation, a hand offering you the Star of David. This t-shirt made of 100% Combed-Cotton T-Shirt. Our t-shirts are made of 100% cotton and are long lasting with bright colors. Our products are all designed and printed in Israel.